The Sony DSR-1800AP is a PAL System DVCAM studio edit deck that also plays back consumer DV cassettes. This is a full-featured deck ready for any edit environment, even old-school linear, tape to tape edit suites. It can take analog inputs and output to digital tape or take a digital source and output an analog signal. It also sports Dynamic Motion Control for the ability to stretch or compress real time images to your insert editing needs. As an added bonus, the machine will even play all DVCPRO tape sizes including medium size. 16:9 Aspect Ratio Capability: When the deck receives a wide aspect ID signal, the DSR-1800P will record and playback 16:9 aspect pictures captured with cameras like the DXC-D35WSP, DXC-D50WSP, DSR-570WSP, and the DSR-PDX10P. 4 Channels of Audio: Audio edit and control features like Mix, Swap, and Fade takes full advantage of the DSR-1800 4 channels of audio. In addition, the 4 audio channels can be edited independently. Dynamic Motion Control: DMC feature allows variable speed playback for special effects or creative problem solving. These speed variations and their start and end points are stored for later playback. Use this feature with all the DV based formats including DVCPRO. TBC Adjustments with the Ubiquitous UVR-60: Picture look and video set-up adjustments can be made with the UVR-60 TBC remote through the 15-pin connector on the back of the machine. Video Process Control: The DSR-1800P has Video Process Control feature which enables greater control over analog and digital outputs. The various thresholds of this feature can be changed via the UVR-6O. Machine Control Protocols for Linear Edits: Frame accurate linear editing can be achieved with the RS-422 port and various equipment such as the RM-450 edit controller. Additionally, the deck will work with Firewire digital control with the optional DSBK-1803 board. Channel Condition Monitoring: The DSR-1800P has a three-color channel condition indicator, with each color representing a particular error rate threshold level. This feature enable operators to quickly identify conditions of the deck and the tape. Bars and Tone Signal Generator: Equipped with a built-in signal generator, the DSR-1800P can generate color bars or black burst video, with or without 1kHz tone. Flexible Input Signal Selection: The DSR-1800P allows flexible combinations of video and audio signals to be input. It is possible to select the digital interface for video with the analog interface for audio. DVCAM Digital Component Recording Format The DVCAM format uses 8-bit digital component recording with a 5:1 compression ratio and a sampling rate of 4:1:1. The DV compression algorithm provides excellent picture quality and superb multigenerational performance. PCM Digital Audio The DSR-1800A provides excellent PCM digital audio performance with a wide dynamic range and an excellent signal-to-noise ratio. There are two selectable audio recording modes: 2CH mode with 48 kHz/16-bit or 4CH mode with 32 kHz/12-bit. Playback Compatibility with DV (25 Mbps) Formats The DSR-1800A offers excellent playback compatibility with DV family formats (25Mbps). The DV family formats include DVCAM, DV (SP mode only) and DVCPRO 25*. These tapes can be played back and utilized directly as editing materials with +/-0 Frame accuracy. *Playback signal of DVCRO recorded tape is not available via SDTI(QSDI) and i.LINK interfaces. Triple-positioning Cassette Compartment Triple-positioning cassette compartment automatically accepts DVCPRO M-size cassette tapes in addition to standard and mini size cassette tapes of DV, DVCAM and DVCPRO. Cassette insertion is done without the need for an external adapter, or the need to set the playback format mode before use. Built-in Jog/Shuttle Dial A highly responsive Jog/Shuttle dial is built in on the front panel. This feature is ideal for searching for desired edit points. Digital Slow Motion and Jog Sound The DSR-1800A offers a variable speed playback function with a range of -0.5 to +0.5 times normal speed. Play back of digital noiseless slow motion pictures and jog sound is also possible within this range. This enables the fast and accurate locating of edit pointson the tape. This feature is available for all DV (25Mbps) format recorded tapes. Frame Accurate Editing The DSR-1800A is equipped with an RS-422A remote control connection to interface with the other compatible equipment. Audio Editing Capabilities Audio cross-fade function is available for noiseless audio transitions at editing points. Audio mix/swap and voice-over functions are possible without any delay between the video and studio signals. In addition, all four audio channels can be edited independently, which is applicable in creating or editing video material in multiple languages, or implementing multiple audio sources. 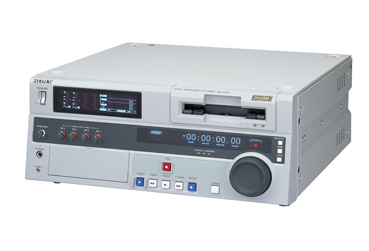 DMC (Dynamic Motion Control) By utilizing a DMC-capable editing controller, the DSR-1800A can vary the playback speed for a certain section of a tape in the range of -0.5 to +0.5 times normal speed. Segments can be stored in memory for playback at the same speed. NOTE: DMC is not available through i.LINK and SDTI(QSDI) due to minute speed video data processing capability. Clip Link Operation By integrating the DSR-1800 into a non-linear editing (NLE) system which supports ClipLink operation, the VTR is able to send ClipLink information data onto the NLE unit, providing great efficiency throughout the editing process. Process Control (Video Control) The DSR-1800A is equipped with Process Control for both analog and digital outputs in order to obtain highly stable video signals. With Process Control, the video level, chroma level, hue, Y/C delay Sync phase, SC phase and Set up (black) for composite, S-video, component and SDI outputs can be controlled through the VTR menu. These features can also be adjusted from an external TBC remote controller through Video Control port (D-sub 15-pin) on the rear panel. VITC Time Code The DSR-1800A supports time code in the sub code area on a tape, and also VITC through all video signal interfaces. This time code is recorded on the video tracks. VITC output is achieved by inserting the signal into the vertical-blanking interval. The time code in sub code area can also be output as VITC. Channel Condition Monitoring The DSR-1800A has a three-color channel condition indicator, with each color representing a particular error rate threshold level. This function enables operators to quickly recognize the condition of a VTR or tape for more reliable editing operation. Built-in Signal Generator The DSR-1800A is equipped with a built-in signal generator, which can generate color bars or black burst for video, and 1 kHz tone or mute signal for audio. This is very convenient for creating pre-striped tapes before editing. Universal Powering System The DSR-1800A is equipped with a universal powering system that can accommodate AC 100V to 240V, 50 or 60 Hz . A built-in regulator switches the unit to the appropriate voltage automatically. This allows the DSR-1800A to be used worldwide without the need for a transformer. Auto Repeat Function Auto repeat function is available through the VTR menu. Time code can also be set as start and stop points.